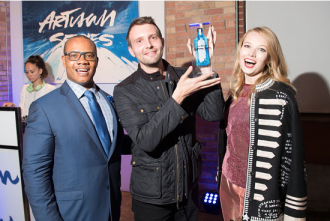 After a four month search, the Bombay Sapphire Artisan Series has determined the three regional finalists from Vancouver, Montreal and Toronto to compete for the opportunity to collaborate with Artsy on a custom, immersive installation in New York City. The prize will include a $10,000 USD stipend to create the installation. The three artists were selected by an esteemed panel of judges in each city after a group exhibition at Winsor Gallery in Vancouver, Duran Mashaal Gallery in Montreal and Only One Gallery in Toronto. The winners competed against 56 of their peers after being selected by Artsy curators from the 2,577 submissions. Each artist has won a trip to Miami to exhibit their winning work at SCOPE Miami Beach December 5 -10. On Friday, December 8th, Artsy will determine the winning artist at a Bombay Sapphire party in Miami. The Bombay Sapphire Artisan Series' mission is to discover the next big name in visual arts. The Bombay Sapphire Artisan Series will feature all of the entries from Vancouver, Montreal and Toronto on the Artisan Series website, which will be open to public voting. The two entries with the highest overall votes will be deemed the online winners and will advance and showcase their art at SCOPE Miami Beach. Go to www.bombayartisan.com to vote. Vacillating between painting, sculpture and installation, Michael Vickers’ modulating forms develop an autonomous and distinctive visual language. Insistently remodeled industrial sheets of metal, folded fabric and molded plexiglas morph into artworks, as gradients of brightly-hued paint camouflage their unyielding surfaces. By relying on acts of negation, and investigating notions of inner and outer space, the compositions simultaneously convey familiarity and strangeness, weightlessness and mass, fragility and monumentality, playfulness and menace, completeness and provisionality.